Mole crickets acquired their name because they look like moles. Much like moles, they nest in lawns, feed on grubs and worms and can cause damage to valuable root systems. Though located in many states, Mole crickets are more of a problem in the southeast and southwest. In fact, this species of cricket is thought to be responsible for more than $30,000,000.00 of damage each year in the state of Florida alone! Mostly nocturnal, mole crickets forage for food at night. In the southern most regions, they will remain active year round. Eggs will be laid continuously and since adult females lay hundreds of eggs, lawns can become infested within a year if left untreated. Mole cricket eggs hatch in less than a month and immature crickets will quickly start to forage through turf looking for small organisms on which to feed. This tunneling causes damage to plant and grass root systems. Although young crickets can jump fairly well, they will loose this ability as they mature and eventually rely on moving through the ground as their main means of travel. Mole crickets are good fliers. They have been observed to fly more than 5 miles and may do so during mating periods. Mole crickets are attracted to lights which leads to houses. Once they land and begin looking for food on residential property, mole crickets will more than likely want to stay. As they begin creating nests, you will start to notice burrows or holes which resemble moles. Although smaller, many people mistake them for moles and try trapping with conventional mole traps. Needless to say, this method of mole cricket control will not work. Mole crickets will damage grass, plants and flowers where they tunnel. And if the damage they do does not concern you, the damage their predators cause can be much more severe will cause may prompt you to treat. Mole crickets are highly nutritious and once populations begin to grow, expect several species of wildlife to come looking for the bounty. Common predators of mole crickets include birds, rats, skunk, armadillos, raccoon and foxes. These animals will not have a noticeable impact on the mole cricket population but they certainly will destroy your lawn. If mole crickets are active in your neighborhood and you want to make sure they don’t appear in your yard, a little bit of preventive maintenance will go a long way. Using the bait below, you can generally stop them from getting established where you treat. But the liquid spraying will last longer and control a much broader range of insect pests. Although baiting for mole crickets won’t work well on any significant population, it can work by intercepting foraging crickets who enter your yard. Treat every 2-3 months with MAXFORCE GRANULES at the rate of 1 oz for every 1800 sq/ft. Foraging mole crickets love this protein based food and will die within 2-3 days of feeding. Simply sprinkle it around the yard making sure to get all property borders and mulch or flower beds they might target. Maxforce performs best when wet so it is most readily accepted after a rain or lawn watering. 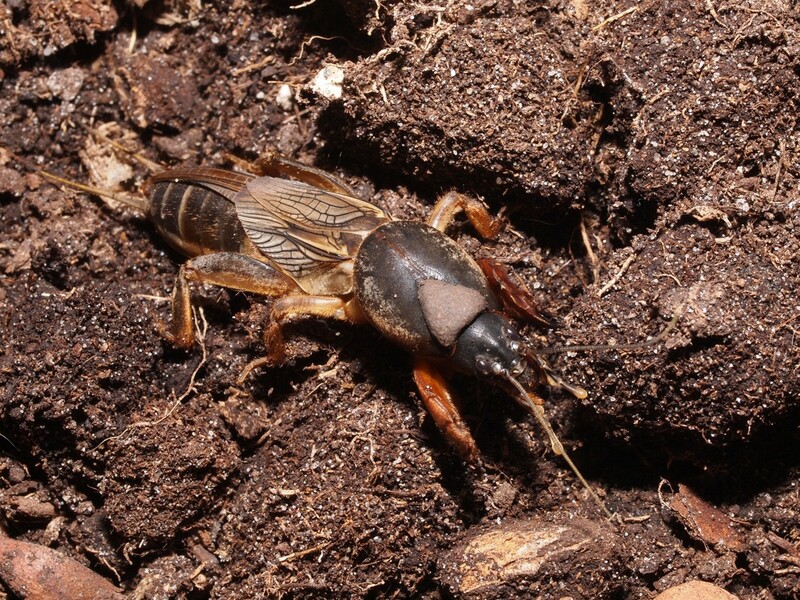 Established mole cricket populations will require chemical treatments to knock them out. Due to where and how mole crickets behave and live, expect to do several treatments over the course of any growing season. If you are persistent and stick to a schedule, you should be able to keep them under control but you must remain diligent. First, be sure to start treatments as soon as you know you have a problem. Second, don’t expect one application to knock them out. In most cases, it will require at least two. The best approach is to treat once a month for three months. After that, using the Maxforce listed above will usually keep them from coming back. Alternatively, spraying with either of the two products listed below will keep them away as long as you treat every 2-3 months. Since Mole Crickets are hard to kill, you need a strong working active and ideally, a non-repellent. These actives won’t spook target pests and cause them to nest away from where you treat. The best product for the job is our 97% ORTHENE. This active is highly effective on a range of garden pests and in particular, mole crickets. Over the years, many of the pyrethroids used on mole crickets have caused some to be resistant but this won’t happen with Orthene. Use 1 oz per 1-3 gallons of water per 1,000 sq/ft. The 1 lb bag is enough to treat about 16,000 sq/ft of turn. When treating for mole crickets, its important to use a lot of water. Active nests and burrows you see should be drenched to help get chemical where it matters. And over the turf, pine straw and wood chips where they might be hiding, adding some SPREADER STICKER to your tank mix will help by getting the active down into the soil. Add 1 oz of Spreader Sticker with every 1 oz of Orthene to help get deep penetration. And though a PUMP SPRAYER can be used to make the application, you’ll be best served using a good HOSE END SPRAYER. With our sprayer, you should add 2 oz of Orthene and 2 oz of Spreader Sticker to the tank and then fill it with water to the 5 gallon line. Next, hook it to your garden hose and disperse the entire amount over 2,000 sq/ft. Yes, this will use a lot of water. But again, a lot of water is needed to get the chemical down into the ground where mole crickets like to nest. 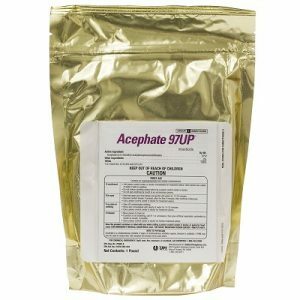 For the longest time, we had a product labeled for Mole Crickets called Orthene WP. It had a 75% Acephate active and worked great for mole cricket control programs. 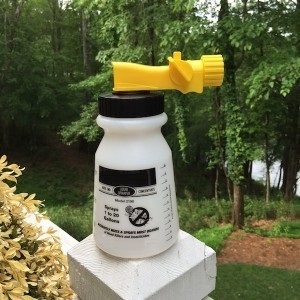 That product was taken off the market over 10 years ago but there is another product which uses the same exact formulation known as FIRE ANT KILLER. If you know of the old Orthene formulation and would like to get something like it, the Fire Ant Killer is as close as you’ll find on the market today. It does have a strong smell – like rotten eggs or bad cabbage – but it works. And since it’s labeled for use on the ground for fire ant mounds, the label usage allows for applications to the same location and site where mole crickets reside. If you’re put off by the sulfur like smell of orthene, go with ADONIS. This odorless concentrate is another non-repellent designed for use in turf, plants and shrubs for a wide range of insect pests. Adonis will take a few days to kill mole crickets much like the Orthene. But because they don’t know its present, they won’t scatter or relocate even after you treat. Adonis goes a long way. The small 27.5 oz jug is enough to treat an acre. 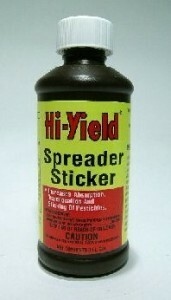 Use .6 oz per 1,000 sq/ft in 2-3 gallons of water along with 1 oz of the Spreader Sticker listed above. Treat once a month until they’re gone; once every 2-3 months to ensure they don’t return. Using our Hose End sprayer listed above, you’ll need to add 1.2 oz of Adonis and 2 oz of Spreader Sticker to the tank. Next, fill the sprayer to the 5 gallon line with water and hook it to your garden hose. Spray the entire tank over 2,000 sq/ft. For a 4,000 sq/ft area, add 2.4 oz of Adonis, 4 gallons of Spreader Sticker and fill the sprayer with water to the half way mark. Spray the entire amount over 4,000 sq/ft. Mole crickets are a tough and persistent pest and if left to nest in your yard untreated, they won’t go away. 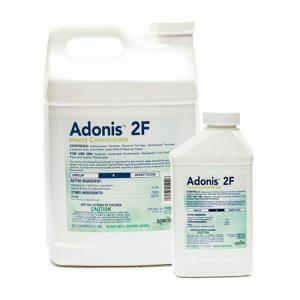 Since most traditional insecticides will only push them around the yard, you’ll be best served using either Orthene or Adonis. These non-repellents take a few extra days to work but they’ll do the job for good. Once the local crickets are gone, treat with Maxforce Granular bait every 2-3 months to ensure they don’t come back. Do mole crickets leave mounds of dirt when the dig into your lawn? They can. But right now there are many other insects and even animals that typically make holes in the yard most any fall season. Insect wise we see this behavior from wasps, mole crickets, ground beetles and spiders. Animal wise we see this behavior with frogs, chipmunks, crayfish, lizards, gophers, moles, shrews, mice and rats. But if you’re not able to figure out what’s doing the digging and would like to put into place some kind of protective barrier, there are a few things that can be done. First, a general treatment will Talstar Granules and Talstar concentrate to all your turf (lawn, flower beds, mulch areas, etc.) will no doubt control any type of insect pest it might be. Now if you feel that it’s more likely an animal of some sort, the Pest Rid Granules should be applied followed by the Pest Rid Spray. It will effectively repel any of the listed animals above for a month or more from the treated areas. I live in an apartment complex that has about 20 acres of property. Is it possible to treat the area in front of my building and still expect results? Or, once I rid them from this area will they just keep coming back by the hundreds each breeding season? My problem is the owners and management. They are not too kind to the idea of the tenants messing with things like this. They say they have people to take care of these things but they don’t come around and treat. I am disabled so imagine my fear when I open the front door after dusk and they come flying into my apartment. The babies have hatched about 10 days ago and they like to fly around the lights at night like moths do. What can I do to help myself since the owners won’t do anything? Just imagine owning a multi million dollar apartment complex in Florida and not wanting to put up a few extra bucks for this? What idiots. Thanks for any help you can give me. No doubt mole crickets are attracted to lights and will be nuisance if allowed to fly there all night long. But if you spray the Talstar listed above on the siding where the light is on, this should help curb the activity. Basically cover a 10′ by 10′ square with the treatment (surrounding any light fixtures) and the treatment will either repel the crickets sensitive enough to detect it or kill any that choose to ignore it and land on the treated surface. But directly treating their mounds with the Talstar will tend to push some around when dealing with the numbers you’re reporting so don’t use it in your lawn. A better active to use in the turf would be Dominion 2L. This is a slow acting product that’s not detectable by insects. But once it gets on a cricket, it will be carried around for days before it kicks in and starts working. During this time it will affect eggs, larvae, etc and when it finally starts to work, the entire nest will be killed. So if you apply a 3-5 second spray down each tunnel, the mole crickets living in that nest will die within 4-7 days. And here is how you should proceed. Let’s say you spray on a Saturday. Give it a week and then the following Saturday, push some dirt over any tunnels in the area you think you treated. Give it another day and then Sunday, go outside and see if any of the tunnels you covered reappear. If so, they’re either tunnels you missed or new tunnels. Go ahead and treat them and then do the same thing a week later. In theory, after the second week, most if not all of the tunnels in the treated area should be shut down. There after, I would expect you will need to do the same thing every 3-6 months unless you’re okay treating single nests as they are seen. Either way, you should have no problem keeping your little section mole cricket free regardless of the surrounding property. Can these products be used in a vegetable garden? I have a bad problem. For the most part, yes. What I mean is that if you read our article, you’ll learn we have several products listed and if your intent was to treat the nests directly by spraying down and into the tunnels, any of the chemicals could be used since the areas being treated would be in the ground and not the plant itself. So the Cyonara could be applied in these areas safely. But we also have a couple of organic options listed which are so safe they can be sprayed directly on the plants so these too should be considered. However, organic products won’t be nearly as strong compared to Cyonara but if you’re more comfortable applying something organic, go with the Insecticidal Soap or better yet, the Essentria IC. We have horse pastures which abut by fence to our lawn. We have had a problem with mole crickets and fire ants in both lawn and pasture, almost destroying both. What products do you recommend and what time of year should we apply the products. We are getting ready to plant ryegrass in 2 of our pastures this week. We live in Panama City, Florida. Many pests are quite active in the fall and for that reason, its no doubt the best time to treat. In fact mole crickets and fireants are especially active as they become aggressive prior to the arrival of winter. But this makes them more vulnerable and easy to target so if you want to get a handle on them along with many other pests, treat now. As for what to use; you don’t mention how big the pastures are but in general, the best active for any kind of area larger than 1/2 acre is Bifen XTS. You only need to apply 6 oz per acre for most pests and that includes fire ants and mole crickets. Use any kind of spray system to do the treating; just make sure to use enough water. That means no less than 40 gallons per acre (but not more than 400). We have mole crickets and they are killing our grass. There are newly hatched ones as well. I want to buy the best product for our situation but I am concerned about getting a product that might be hazardous to our small (7 lb) puppy who seems to want to eat anything grass related in the yard. What product would be safe and effective? Go with Essentria IC. It uses food grade actives and won’t be hazardous to your puppy even if ingested. Use it two ways to get control of the problem. First, mix up 4 oz per gallon of water and spray 8-16 oz of mixed material down active nests. Next, broadcast 1 gallon of mixed spray per 250 sq/ft using 2 oz per gallon. A good pump sprayer will make treating their nests easy.